aanii! aaniish naa? i hope all is going well. its going well out here on the open range where in every direction there is sunshine, blue skies and the sound of crickets. the river is running slow and clear, you can walk from one end to the other, barefoot, and not get your shorts wet! inside: we have Ella Fitzgerald, Dinah Washington, Billy Holiday, Tony Bennett and John Coltrane providing the musical backdrop. nice work. so the Manitoulin Art Tour has come and gone. same with the Wikwemikong Indian Days Pow wow. and the ever kooky Providence Bay Fair, 129th edition, is also here and gone. that pretty much means summer will soon be in the history books. you can see it in the way the sun shines its big light on the trees around here. the sun is going south! the garden is working its magic. we have fresh cucumbers, tomatoes, and potatoes every day! not bad since we went the whole month of July without a drop of rain. of course when you live on a river the lack of rain doesn’t mean much. all of these beauty scenes i’ll carry along with me when i take a ride over to Ottawa this week. you see my old buddy Morden has a date over there and i’ll be happy to take her over there and bring her back! a car trip with that beautiful creature is a perfect way to bring the summer in for a landing. while we are there i can pick up those much needed art supplies because you see!!! we have a show at the Cube Gallery in Ottawa, in mid September. i’ll post the details as soon as i have them. as for this week’s trip to O Town, not a bad time of year either to boo through the National Gallery and get some up close and personal views of the Van Gogh’s they have hanging there. and maybe… visit a few of the clubs and enjoy some urban night scenes which you can guaren dang tee are a far and long distance away from the rural night scenes we have out here, including that summer night a gang of us rolled out the blankets on the front lawn to take in the Perseid Meteor Shower! we shared a few kooky stories, some spooky, while we enjoyed the front row seats in the zero light and noise polluted boon docks of home sweet home. it is a grand place, out here on the open range, in the sweet summer time. but you have to love peace and quiet. you have to love the sound of falling water or water rolling over stones. you have to love sunlight, blue skies, the giant greens, hummingbirds, and morning walks through the fields or barefoot over the limestones in ankle deep water. that’s what it is out here. 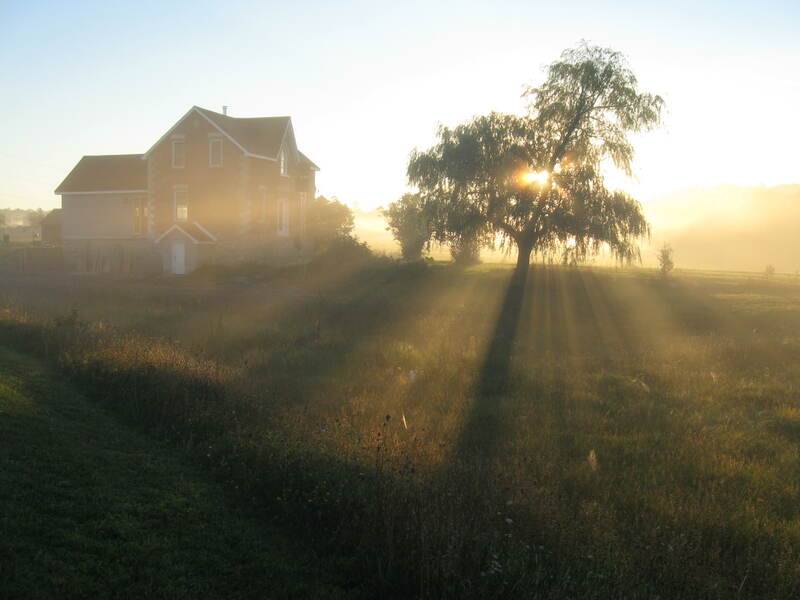 its a photo from last summer, but here is the willow tree in the front yard at sunrise, in an August past. true love.